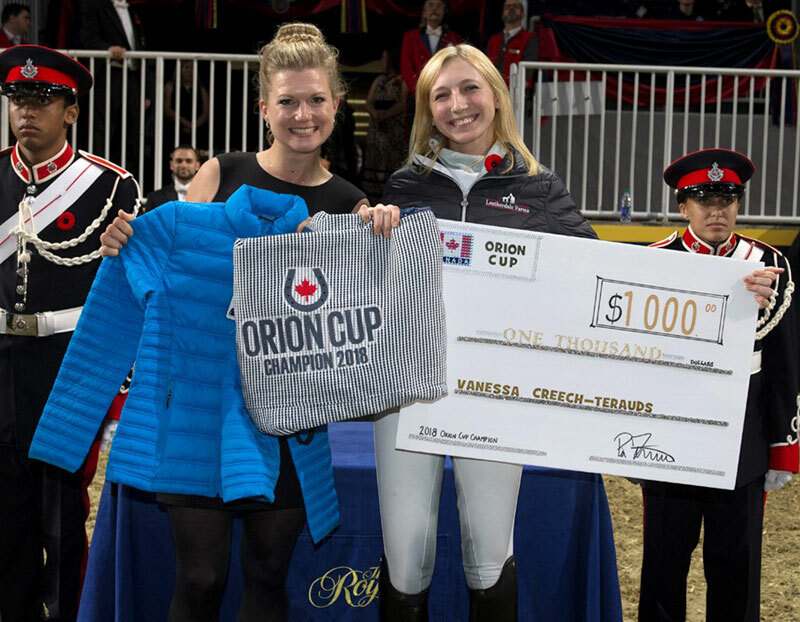 Equestrian Canada (EC) has awarded Vanessa Creech-Terauds of Caistor Centre, ON with the 2018 Orion Cup in recognition of her successful rise through the dressage levels. Presented to a promising dressage athlete in the process of transitioning from the Young Rider level to Grand Prix, the Orion Cup was created in memory of one of Canada’s most well-known equine dressage stars. Open to Canadian dressage riders aged 16 to 25, the award is presented to the rider with the highest average of three scores from the Under 25 (U25) Grand Prix level. Scores obtained at CDI-level competitions receive a 1% bonus. The program encourages young athletes to focus on training and planning at an elite level, with tangible goals and confidence. Creech-Terauds earned the coveted title for 2018 after achieving a total qualifying average of 66.561% at the CDI-U25 level with Devon L (De Niro 6 x Wolkenstein II), an 18-year-old Hanoverian gelding co-owned by Diane Creech and Louise Leatherdale. Each of Creech-Terauds’s three qualifying scores represented a first-place finish in their respective CDI-U25 Grand Prix class: 65.231% on March 2 during the Adequan Global Dressage Festival in Wellington, FL; 66.325% on June 16 at the Cedar Valley CDI 3* in Cedar Valley, ON; and finally, 65.128% on Sept. 29 at the renowned Dressage at Devon in Devon, PA. With all scores being earned at CDI-level competitions, Creech-Terauds was awarded a 1% bonus per score. Orion (Jazz x Consul), a 1996 Dutch Warmblood gelding, was an Olympic Team horse for Canada and was trained to the advanced level by Fortmuller’s former coach, Leslie Reid, who rode Orion at the 2008 Beijing Olympic Games. In 2009, Fortmuller took over the ride on this incredibly talented horse. The pair would go on to compete at the Grand Prix level, culminating with their selection as the reserve combination for the London 2012 Olympic Games. Sadly, Orion died at the start of 2014. His passing was a devastating loss to Fortmuller and her family, as well as the Canadian Dressage Team. The Orion Cup pays tribute to this very special horse. Just as Orion was instrumental to the start of Fortmuller’s Grand Prix career, this award provides other talented Canadian dressage athletes with a leg-up in the sport. For more information about the Orion Cup, click here.